Welcome to Tassie everyone! So good to see you all. 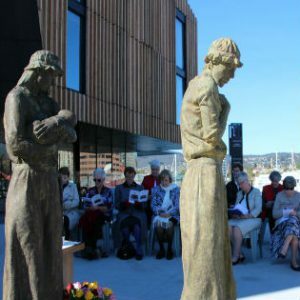 Today we gather to give thanks to God for three courageous Sisters of Charity: Mother Mary John Cahill, Sr Mary De Sales O’Brien and Sr Xavier Williams, who stepped onto this Wharf to begin their ministry of love in Hobart 170 years ago. As we gather here on the wharf where the Sisters were welcomed, let us take time to reflect on this part of our story and give praise to God for all that has been accomplished by our Sisters in caring for the people of Tasmania. Today we stand on their shoulders and the shoulders of all Sisters of Charity after them, who worked tirelessly to bring the love, care and tenderness of Christ to all on this faraway land then called Van Diemen’s Land. The tired sea voyagers stepped off the “Louisa” into smaller boats as it was not suitable for “Louisa” to come close to the wharf. A great crowd had assembled to meet them. And here we are today in that same place remembering and honouring that precious moment in our history. Let us just close our eyes for a moment and imagine that moment as we sit on that same wharf today. A very different atmosphere prevails today. What do you think they were feeling? What do you think they might have been saying to each other as they walked up Macquarie St to St Joseph’s Church for their welcome? It would have been a cold, chilly June morning but the “heart-shaped Island gathered into a warm embrace” for these three magnificent women. Those three Sisters would have recalled the severe trials of Mary Aikenhead in establishing our Congregation and I believe they would have gone forward and stepped onto this wharf in a spirit of the deep faith which animated Mary Aikenhead. Two Congregations now existed. From the seeds sown in 1847, the life and mission of the Sisters of Charity to bring the love, tenderness, and concern of Christ to all, grew and grew. Children continue to be educated, the sick and dying were cared for through St Vincent’s Launceston, orphans were housed and loved through St Joseph’s Orphanage, Aikenhead House and St Joseph’s Child Care, the prisoners were visited and the need for specialist grief and trauma counselling was met through Sisters of Charity Outreach Devonport; the Gospel imperative to serve the poor has been made real by one of our Sisters “Journeying” through the Scriptures with the people and other Sisters providing spiritual care through Retreats and visitation. 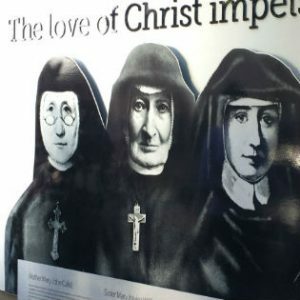 The mission continues through the presence of the Sisters who are faithful in their returning to visit Tasmania and to support and provide ongoing education to our lay men and women who now carry the mission of Jesus and the spirit of Mary Aikenhead forward. Sisters Cathy Meese, Helga Neidhart, and Anne Taylor support the bigger picture of Catholic Education in Tasmania by serving on Boards and mentoring personnel. The presence of Mary Aikenhead Ministries ensures our works continue. 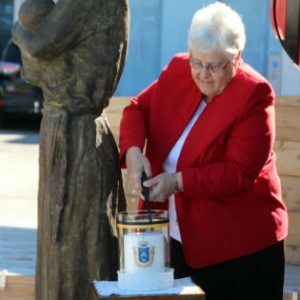 There are now two Pilgrimages a year to walk the footsteps of the three Sisters and the growth of the mission in Tasmania since 1847. 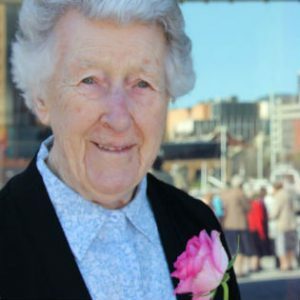 Sr Anne Turner remains the sole Sister of Charity resident in Tasmania and carries the lamplight of those three Sisters. 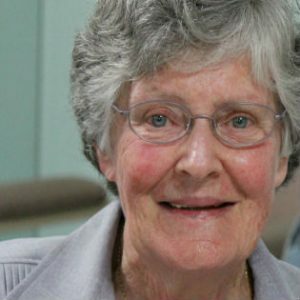 Sr Josephine Cannell, 18 weeks off being a hundred born and breed in Tasmania, continues to carry our story and remind us of it. In faith we can say all will be well. And what of our future in Tasmania? We leave that for the Providence of God. So let’s rejoice in this moment we are remembering here today. God’s Spirit and Mary Aikenhead’s spirit are still “a-movin” all over the world (as the song goes) – yes, even as far away as the Apple Isle of Tasmania. As Mary Aikenhead would exclaim in praise: Amen! Amen! Images 1 – 4 by Srs Margaret Fitzgerald and Genny Walsh.